• The tailgate is locked or unlocked when all doors are locked or unlocked with the key, transmitter or central door lock switch. 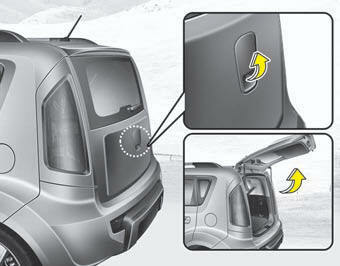 • If unlocked, the tailgate can be opened by pressing the handle switch and then pulling the handle up. Make certain that you close the tailgate before driving your vehicle. Possible damage may occur to the tailgate lift cylinders and attached hardware if the tailgate is not closed prior to driving. Emergency tailgate safety release Your vehicle is equipped with the emergency tailgate safety release lever located on the bottom of the tailgate. When someone is inadvertently locked in the luggage compartment, the tailgate can be opened by pushing the release lever and pushing open the tailgate. locked in the luggage compartment. • No one should be allowed to occupy the luggage compartment of the vehicle at any time. 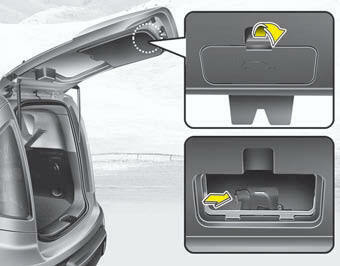 The luggage compartment is a very dangerous location in the event of a crash. caution, especially while the vehicle is in motion.